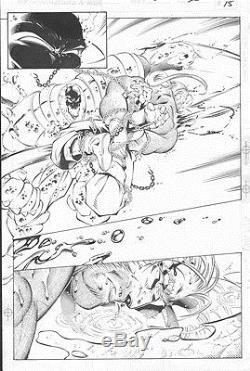 Offered here is page 15 of Astonishing X-Men # 3 which is penciled by fan-favorite artist Joe Madureira and inked by the stellar Tim Townsend! This terrific 1/2 page splash features Holocaust vs. The artwork is done on a sheet of standard comic art board which measures approximately 11" x 17". The art is in excellent condition and is being offered at NO RESERVE!! Please note that the artwork extends into the margin on the left side and goes to the edge of the board. For a link to my web-site where you will find additional artwork by many of today's top comic artists. The item "ASTONISHING X-MEN # 3 Pg. SPLASH" is in sale since Sunday, August 14, 2016. This item is in the category "Collectibles\Comics\Original Comic Art\Other Original Comic Art". The seller is "capshockeyfan" and is located in Cheltenham, Maryland. This item can be shipped worldwide.